Haters gonna hate. It’s one of the most accepted aphorisms of all time, because hate is easy. Hate gets to conceal its identity under white sheets and pointed hoods as it lights crosses on lawns. Hate hides behind computer screens and anonymously hurls the n-word on social media. Hate smiles in your face and stabs you in New York City’s Times Square. Maybe that’s why haters hate—because there are no consequences. It is easy to spread racism and prejudice when there is no fear of repercussions. If there were someone fearless and committed enough to unmask the faces of hatemongers, maybe haters would have second thoughts. 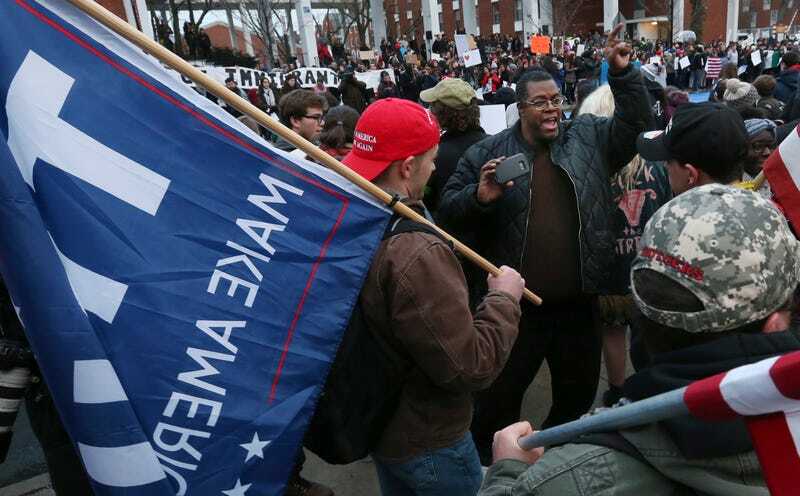 Meet Daryle Lamont Jenkins—neo-Nazi hunter. For more than 30 years, Jenkins has dedicated his life to chasing down white supremacists and exposing them to the glare of public scrutiny. His unapologetic style of reap-what-you-sow justice mixes the Southern Poverty Law Center’s meticulous method of cataloging hate groups with the guerrilla vigilantism of Anonymous. Jenkins is relentless in his quest to drag fascists out of the shadows and into the disinfecting sunlight, and has amassed a network of photographers, reporters and regular citizens dedicated to his cause. That simple quest sent him on a mission that eventually blossomed into his life’s work. He became obsessed with newspaper articles and press clippings about Ku Klux Klan rallies, but it was The Oprah Winfrey Show that jump-started him into the arena of public activism. As a member of the alternative music and punk rock scene, Jenkins adopted the underground “fanzine” method of publicity and began sharing his information with others, and even started his own cable-access show. He scanned the New York area’s burgeoning conservative radio programs and began to notice the growing connections between the conservative movement and the fringe right. “These mainstream, right-wing hosts like Bob Grant would regularly have guests like Jared Taylor on their radio shows,” said Jenkins. In 1999, Jenkins started a small website dedicated to revealing the ties between fringe groups and the conservative movement. After a few minutes with Jenkins, you begin to wonder why he even needs a website, or videotapes, because he seems to have an encyclopedic memory of racist groups and individuals that borders on being a rare form of white supremacist savant. He spits out the names of harbingers of hate as if he knows them personally—and, in a sense, he does. The “this guy” to whom Jenkins refers is Fox News commentator, and right-wing superhero, Sean Hannity. That simple sentence is the motto and clarion call for One People’s Project, an organization dedicated to researching and reporting on “right-wing groups, individuals and activities, and encourages society to be vigilant against them in an effort to diminish their ability to function and cause that society harm.” Jenkins started the project and website in 2000 after Richard Barrett, leader of the white nationalist group the Nationalist Movement, organized a rally in Morristown, N.J. Noticing the rise of hate groups in the Northeast, Jenkins realized that the mainstream press seemed unconcerned. “If they won’t cover it, we will” was the mantra with which Jenkins began One People’s Project. Since starting the group, Jenkins has enlisted journalists, photographers, videographers and anyone who wants to expose organized hate groups. Over the years, One People’s Project has outed legions of racists through its “Rogues Gallery”—a database of individuals who have demonstrable extremist ties. One of Jenkins’ most used tactics is simply attending white nationalist conferences and taking photos and video. Instead of concentrating on the known figures, Jenkins wants to find the troublemakers before they explode. He scans crowds with his camera at neofascist rallies and events and later examines the footage, trying to cross-reference it with other internet data and social media. One People’s Project had photos of James O’Keefe in 2006, years before he secretly taped, and heavily edited, videos that led to the demise of the community group ACORN. In the pictures, O’Keefe poses with members of a white nationalist group and Andrew Breitbart, a then barely known publisher of a different kind of website named after himself. Jenkins also utilizes “sock puppets”—fake social media accounts used to befriend people in hate groups, get on their friends’ lists and see where the trail leads. It sometimes yields interesting discoveries. In 2014, when Anna Zubkova was running for a judgeship in Plainfield, Conn., One People’s Project found her husband’s white supremacist blog and blasted it to the national media. In 2013, One People’s Project doxxed John Stortstrom, an Army engineer with security clearance who worked at the Army’s chemical and explosive facility. The Project posted his picture and job description after Stortstrom attended a white nationalist conference with 150 other extremists. Donald Trump’s run for the White House forced mainstream media to take note of the so-called alt-right—a term Jenkins hates. “I call them white supremacists; neo-fascists. ‘Alt-right’ is their term to try to clean themselves up. We have to be careful not to allow them to change the narrative and slip into the mainstream,” the crusader warned. Trumpmania has also brought attention to One People’s Project. In the past year, Jenkins has made appearances on The Rachel Maddow Show and Today. A&E planned a show based on Jenkins confronting KKK members called Generation KKK and then Escaping the KKK, but the network canceled the show when it discovered that field producers had paid some interviewees. None of this publicity has slowed Jenkins down in his pursuit of fascists. He has started an auxiliary site to One People’s Project called IdaVoxx—a news site named after civil rights activist and journalist Ida B. Wells. He is also scouring the social media accounts of white supremacist and alleged Times Square stabber James Jackson to see with whom he might be connected. If he finds anything, you can be sure that Daryle Lamont Jenkins will put them on blast.